I don't read much YA because I fear running across a female protag who I want to go all little bunny foo-foo on (you know, bop them on the head). 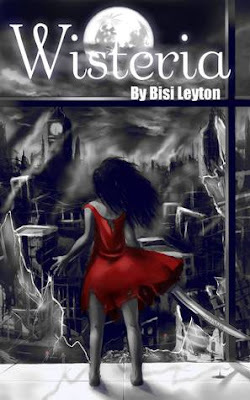 Wisteria is one of the emotionally strongest female YA characters I've read. Dealing with bullying and betrayal she still manages to do the right thing when others would look for revenge. She is a good person thrown into a horrible situation and manages to hold onto her humanity when those around her don't. There are so many layers to this story. The blurb doesn't even begin to cover it. There are two separate story lines: Wisteria's post apocalyptic world and Bach's, we'll call it alien, world. Bach has only experienced the worst of the human race and was raised with no tolerance for the lesser Terrans. The author keeps Bach and Wisteria true to their characters as both try to understand each other. The story stays away from the Romeo and Juliet troupe and delivers something more real. It flirts with some teenage angst, but I like the way Wisteria handles things. And then...plot twists! The two protags start uncovering a conspiracy that shakes both their foundations. The story is well written and moves at a quick pace with a creative plot. Bisi Leyton was born and lives in London.She has worked around Europe including France, Germany, Ireland, Belgium and the Czech Republic. She has a fondness for reading graphic novels, and cracked.com.She grew up in the UK, Nigeria and the States, listening to the stories life and love from aunts, cousins and big sisters. As a fan of the Sweet Valley High Series, she started writing fan-fiction at eleven, will never reveal under pain of death.